Published: Jan. 28, 2015 at 02:52 p.m. Updated: Feb. 19, 2015 at 01:53 p.m. 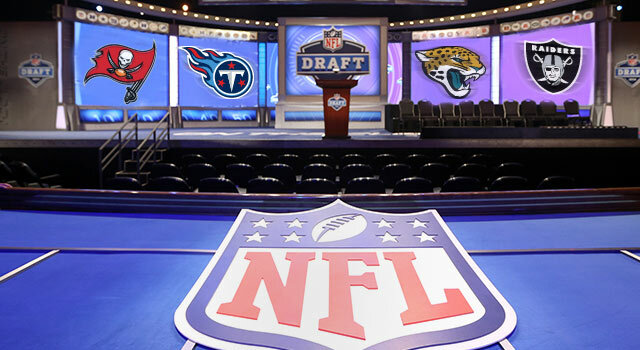 The Buccaneers are now on the clock, followed by the Titans, Jaguars and Raiders. This is the 2015 NFL Draft first-round order, with the top three needs for all 32 teams (order determined by record, using strength of schedule as a tiebreaker. Teams 21-32 were in the playoffs, and their draft order was determined by postseason results). Top-rated prospects at positional needs: OT: Brandon Scherff (Iowa), Cedric Ogbuehi (Texas A&M), La'el Collins (LSU); Pass rusher: Leonard Williams (USC), Shane Ray (Missouri), Dante Fowler, Jr. (Florida); QB: Jameis Winston (Florida State), Marcus Mariota (Oregon), Brett Hundley (UCLA). Top-rated prospects at positional needs: QB: Jameis Winston (Florida State), Marcus Mariota (Oregon), Brett Hundley (UCLA); Pass rusher: Leonard Williams (USC), Shane Ray (Missouri), Dante Fowler, Jr. (Florida); CB: Marcus Peters (Washington), Trae Waynes (Michigan State), Kevin Johnson (Wake Forest). Top-rated prospects at positional needs: OT: Brandon Scherff (Iowa), Cedric Ogbuehi (Texas A&M), La'el Collins (LSU); CB: Marcus Peters (Washington), Trae Waynes (Michigan State), Kevin Johnson (Wake Forest); RB: Todd Gurley (Georgia), Melvin Gordon (Wisconsin), Tevin Coleman (Indiana). Top-rated prospects at positional needs: Pass rusher: Leonard Williams (USC), Shane Ray (Missouri), Dante Fowler, Jr. (Florida); CB: Marcus Peters (Washington), Trae Waynes (Michigan State), Kevin Johnson (Wake Forest); WR: Amari Cooper (Alabama), DeVante Parker (Louisville), Kevin White (West Virginia). Top-rated prospects at positional needs: Pass rusher: Leonard Williams (USC), Shane Ray (Missouri), Dante Fowler, Jr. (Florida); CB: Marcus Peters (Washington), Trae Waynes (Michigan State), Kevin Johnson (Wake Forest); S: Landon Collins (Alabama), Gerod Holliman (Louisville), Derron Smith (Fresno State); OT: Brandon Scherff (Iowa), Cedric Ogbuehi (Texas A&M), La'el Collins (LSU). Top-rated prospects at positional needs: QB: Jameis Winston (Florida State), Marcus Mariota (Oregon), Brett Hundley (UCLA); CB: Marcus Peters (Washington), Trae Waynes (Michigan State), Kevin Johnson (Wake Forest); OT: Brandon Scherff (Iowa), Cedric Ogbuehi (Texas A&M), La'el Collins (LSU). Top-rated prospects at positional needs: Pass rusher: Leonard Williams (USC), Shane Ray (Missouri), Dante Fowler, Jr. (Florida); LB: Dante Fowler, Jr. (Florida), Randy Gregory (Nebraska), Vic Beasley (Clemson); CB: Marcus Peters (Washington), Trae Waynes (Michigan State), Kevin Johnson (Wake Forest); S: Landon Collins (Alabama), Gerod Holliman (Louisville), Derron Smith (Fresno State). Top-rated prospects at positional needs: Pass rusher: Leonard Williams (USC), Shane Ray (Missouri), Dante Fowler, Jr. (Florida); TE: Devin Funchess (Michigan), Nick O'Leary (Florida State), Maxx Williams (Minnesota); CB: Marcus Peters (Washington), Trae Waynes (Michigan State), Kevin Johnson (Wake Forest); S: Landon Collins (Alabama), Gerod Holliman (Louisville), Derron Smith (Fresno State). Top-rated prospects at positional needs: Pass rusher: Leonard Williams (USC), Shane Ray (Missouri), Dante Fowler, Jr. (Florida); OT: Brandon Scherff (Iowa), Cedric Ogbuehi (Texas A&M), La'el Collins (LSU); ILB: Benardrick McKinney (Mississippi State), Denzel Perryman (Miami), Eric Kendricks (UCLA). Top-rated prospects at positional needs: QB: Jameis Winston (Florida State), Marcus Mariota (Oregon), Brett Hundley (UCLA); CB: Marcus Peters (Washington), Trae Waynes (Michigan State), Kevin Johnson (Wake Forest); RB: Todd Gurley (Georgia), Melvin Gordon (Wisconsin), Tevin Coleman (Indiana). Top-rated prospects at positional needs: OT: Brandon Scherff (Iowa), Cedric Ogbuehi (Texas A&M), La'el Collins (LSU); RB: Todd Gurley (Georgia), Melvin Gordon (Wisconsin), Tevin Coleman (Indiana); CB: Marcus Peters (Washington), Trae Waynes (Michigan State), Kevin Johnson (Wake Forest). Top-rated prospects at positional needs: WR: Amari Cooper (Alabama), DeVante Parker (Louisville), Kevin White (West Virginia); ILB: Benardrick McKinney (Mississippi State), Denzel Perryman (Miami), Eric Kendricks (UCLA); DL: Leonard Williams (USC), Shane Ray (Missouri), Arik Armstead (Oregon). Top-rated prospects at positional needs: CB: Marcus Peters (Washington), Trae Waynes (Michigan State), Kevin Johnson (Wake Forest); Pass rusher: Leonard Williams (USC), Shane Ray (Missouri), Dante Fowler, Jr. (Florida); QB: Jameis Winston (Florida State), Marcus Mariota (Oregon), Brett Hundley (UCLA). Top-rated prospects at positional needs: LB: Dante Fowler, Jr. (Florida), Randy Gregory (Nebraska), Vic Beasley (Clemson); CB: Marcus Peters (Washington), Trae Waynes (Michigan State), Kevin Johnson (Wake Forest); OT: Brandon Scherff (Iowa), Cedric Ogbuehi (Texas A&M), La'el Collins (LSU). Top-rated prospects at positional needs: QB: Jameis Winston (Florida State), Marcus Mariota (Oregon), Brett Hundley (UCLA); OL: Brandon Scherff (Iowa), Cedric Ogbuehi (Texas A&M), La'el Collins (LSU); DL: Leonard Williams (USC), Shane Ray (Missouri), Arik Armstead (Oregon). Top-rated prospects at positional needs: QB: Jameis Winston (Florida State), Marcus Mariota (Oregon), Brett Hundley (UCLA); WR: Amari Cooper (Alabama), DeVante Parker (Louisville), Kevin White (West Virginia); OT: Brandon Scherff (Iowa), Cedric Ogbuehi (Texas A&M), La'el Collins (LSU). Top-rated prospects at positional needs: CB: Marcus Peters (Washington), Trae Waynes (Michigan State), Kevin Johnson (Wake Forest); NT: Danny Shelton (Washington), Jordan Phillips (Oklahoma), Grady Jarrett (Clemson); OL: Brandon Scherff (Iowa), Cedric Ogbuehi (Texas A&M), La'el Collins (LSU). Top-rated prospects at positional needs: WR: Amari Cooper (Alabama), DeVante Parker (Louisville), Kevin White (West Virginia); OT: Brandon Scherff (Iowa), Cedric Ogbuehi (Texas A&M), La'el Collins (LSU); CB: Marcus Peters (Washington), Trae Waynes (Michigan State), Kevin Johnson (Wake Forest). Top-rated prospects at positional needs: CB: Marcus Peters (Washington), Trae Waynes (Michigan State), Kevin Johnson (Wake Forest); S: Landon Collins (Alabama), Gerod Holliman (Louisville), Derron Smith (Fresno State); OLB: Dante Fowler, Jr. (Florida), Randy Gregory (Nebraska), Vic Beasley (Clemson). Top-rated prospects at positional needs: CB: Marcus Peters (Washington), Trae Waynes (Michigan State), Kevin Johnson (Wake Forest); S: Landon Collins (Alabama), Gerod Holliman (Louisville), Derron Smith (Fresno State). Top-rated prospects at positional needs: S: Landon Collins (Alabama), Gerod Holliman (Louisville), Derron Smith (Fresno State); DL: Leonard Williams (USC), Shane Ray (Missouri), Arik Armstead (Oregon); CB: Marcus Peters (Washington), Trae Waynes (Michigan State), Kevin Johnson (Wake Forest). Top-rated prospects at positional needs: CB: Marcus Peters (Washington), Trae Waynes (Michigan State), Kevin Johnson (Wake Forest); DL: Leonard Williams (USC), Shane Ray (Missouri), Arik Armstead (Oregon). Top-rated prospects at positional needs: DL: Leonard Williams (USC), Shane Ray (Missouri), Arik Armstead (Oregon); OLB: Dante Fowler, Jr. (Florida), Randy Gregory (Nebraska), Vic Beasley (Clemson); ILB: Benardrick McKinney (Mississippi State), Eric Kendricks (UCLA), Denzel Perryman (Miami). Top-rated prospects at positional needs: Pass rusher: Leonard Williams (USC), Shane Ray (Missouri), Dante Fowler, Jr. (Florida); OT: Brandon Scherff (Iowa), Cedric Ogbuehi (Texas A&M), La'el Collins (LSU); CB: Marcus Peters (Washington), Trae Waynes (Michigan State), Kevin Johnson (Wake Forest). Top-rated prospects at positional needs: Pass rusher: Leonard Williams (USC), Shane Ray (Missouri), Dante Fowler, Jr. (Florida); RB: Todd Gurley (Georgia), Melvin Gordon (Wisconsin), Tevin Coleman (Indiana); OL: Brandon Scherff (Iowa), Cedric Ogbuehi (Texas A&M), La'el Collins (LSU). Top-rated prospects at positional needs: CB: Marcus Peters (Washington), Trae Waynes (Michigan State), Kevin Johnson (Wake Forest); DL: Leonard Williams (USC), Shane Ray (Missouri), Arik Armstead (Oregon); TE: Devin Funchess (Michigan), Nick O'Leary (Florida State), Maxx Williams (Minnesota). Top-rated prospects at positional needs: DL: Leonard Williams (USC), Shane Ray (Missouri), Arik Armstead (Oregon); LB: Dante Fowler, Jr. (Florida), Randy Gregory (Nebraska), Vic Beasley (Clemson); WR: Amari Cooper (Alabama), DeVante Parker (Louisville), Kevin White (West Virginia). Top-rated prospects at positional needs: OL: Brandon Scherff (Iowa), Cedric Ogbuehi (Texas A&M), La'el Collins (LSU); ILB: Benardrick McKinney (Mississippi State), Denzel Perryman (Miami), Eric Kendricks (UCLA); S: Landon Collins (Alabama), Gerod Holliman (Louisville), Derron Smith (Fresno State). Top-rated prospects at positional needs: ILB: Benardrick McKinney (Mississippi State), Denzel Perryman (Miami), Eric Kendricks (UCLA); DL: Leonard Williams (USC), Shane Ray (Missouri), Arik Armstead (Oregon); TE: Devin Funchess (Michigan), Nick O'Leary (Florida State), Maxx Williams (Minnesota). Top-rated prospects at positional needs: TE: Devin Funchess (Michigan), Nick O'Leary (Florida State), Maxx Williams (Minnesota); OL: Brandon Scherff (Iowa), Cedric Ogbuehi (Texas A&M), La'el Collins (LSU); DL: Leonard Williams (USC), Shane Ray (Missouri), Arik Armstead (Oregon). Top-rated prospects at positional needs: WR: Amari Cooper (Alabama), DeVante Parker (Louisville), Kevin White (West Virginia); DL: Leonard Williams (USC), Shane Ray (Missouri), Arik Armstead (Oregon); RB: Todd Gurley (Georgia), Melvin Gordon (Wisconsin), Tevin Coleman (Indiana). Top-rated prospects at positional needs: QB: Jameis Winston (Florida State), Marcus Mariota (Oregon), Brett Hundley (UCLA); LB: Dante Fowler, Jr. (Florida), Randy Gregory (Nebraska), Vic Beasley (Clemson); S: Landon Collins (Alabama), Gerod Holliman (Louisville), Derron Smith (Fresno State).